Renesme’s Bracelet. Hot Topic has already sold out of it, and Amazon is selling it out quickly. Get it for under $20 now before you have to start paying higher prices on eBay. 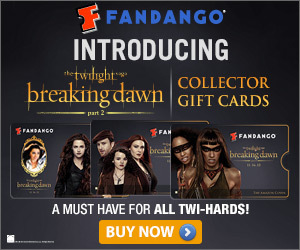 Limited Edition Twilight Breaking Dawn Gift Cards from Fandango. These are great because you can keep them as a Breaking Dawn memento plus use them to see other movies in the future. Choose from as low as $15 or as high as $100. Great stocking stuffers! PRO Beauty Tools Twilight Limited Edition Sparkle Ceramic Styling Iron. I am actually surprised that they are still selling this since it came out last year. But reviews on it are good and it’s something you can use long after Twilight is gone. Twilight Saga Breaking Dawn Locket. 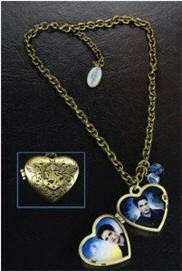 At less than $25, this locket is perfect for Edward fans and hopeless romantics. Breaking Dawn Calendar. There are quite a few to choose from depending on what size you want. All of them feature great pictures of the cast. Lastly, you can’t go wrong with customized Twilight shirts. These are the gifts that tell your favorite fan you know exactly what they like. Find just about every shirt you could want in the CafePress Twilight collection.